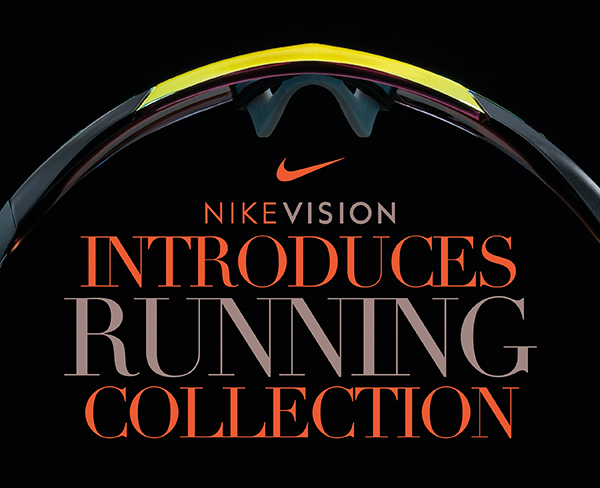 Nike Vision is a collaborative effort between Nike and Zeiss. The new range offers eyewear designed to meet the needs of runners of all levels. The collection consists of highly technical designs engineered for both speed and comfort. Designed using cutting-edge manufacturing methods, the 2016 assortment pushes the envelope of athletic innovation and style while raising the bar for performance eyewear. Responsive Comfort: For the athlete to stay focused, their eyewear needs to stay put. Nike Vision developed new materials and vision technology to create high-performance eyewear that stays stable during movement, grips when the athlete sweats and conforms to the shape of his or her face for maximum comfort. Ventilation Reframed: The minimised, lightweight nose pad is suspended to allow air to flow underneath the frame, and reduce fogging. Strategically placed openings in the temple arms allows for additional airflow and prevents moisture accumulation. Optimised Coverage: The unique design carefully covers the eye protecting it from dust, dirt and other risk of damage. Nike Vaporwing & Nike Vaporwing Elite: Sculpted with aerodynamic features, Nike Vision’s cutting-edge design fuses the lens with the frame to become one cohesive unit, using lighter materials than average performance eyewear. The lens has been pushed beyond where it normally ends, to fuse it with the frame itself. Nike Tailwind & Nike Tailwind Swift: The eyewear design cuts through wind, reducing resistance. Flex points along the temples automatically adjust to the shape of the athlete’s head, to provide a secure fit. A Floating Nose Pad automatically adjusts for optimum grip and comfort, while acting as a shock absorber and increasing airflow. The arms of the eyewear adjust to the moisture level for added comfort. The material is smooth when dry and grips when the athlete begins to sweat. Nike Bandit: Another offering by Nike Max Optics, this eyewear is known to provide precise clarity along with reducing distortion for uninterrupted vision. In addition to its stylish design and comfort fit, the material used in this eyewear is smooth when dry and grips when the athlete begins to sweat. Soft rubber channels on the inside of the temples wick away sweat from contacts points and increase airflow.